Combines substances studied for their role in bone marrow adult stem cells. Excellent prospects for increasing quality of life and average lifespan. Stem cell therapy represents both a major medical advance and a great hope in the fight against degenerative conditions for which medicine has so far only provided short-lived or temporary solutions. It is now possible, in some countries, to have injections of adult stem cells extracted from bone marrow, or indeed ‘cultivated’ after extraction from adipose tissue, though more generalised application of this method is still some way off, due to its cost and complexity. ¤ It is this issue that most studies have concentrated on in recent years, and certain researchers have indeed managed - by using nutrients and botanical extracts - to stimulate and increase numbers of adult stem cells in bone marrow. ¤ Researchers are focusing on bone marrow as the source of this regeneration activity, as these cells are renewed on a daily basis, producing new lines of red and white blood cells and platelets. Mature cells are then released into the bloodstream to fulfil their vital, regenerative functions. • Extract of Polygonum multiflorum or FO-TI, which when given at the optimal dose of 800mg of a 12:1 extract, is recognised in Chinese medicine as an effective blood tonic, and in particular as a major factor in longevity due to its ability to increase levels of circulating superoxide dismutase (SOD) and monoamine oxidase. Mouse studies conducted in Taiwan show that after daily administration of high-dose Polygonum multiflorum, significant improvements were noted in red blood cells, and in particular, a higher percentage of hematocrit compared with a control group. This research also shows that doses at this level stimulate proliferation of stromal and haematopoietic stem cells in bone marrow. • Fucoidan is recognised for its immune-stimulant properties and is widely used in Japan to treat cancer. It is extracted from a type of algae, Laminaria japonica, part of the laminaria family. This sulphated polysaccharide boosts the immune system, helping protect the body more effectively against different viruses and in particular, promoting apoptosis (programmed cell death) of cancer cells. - Like other active algae extracts, fucoidan has demonstrated, at certain concentrations, the ability to stimulate bone marrow stem cells. Studies showed it produced an increase in alkaline phosphatase activity, and at a molecular level, improved the expression of specific genes related to osteogenesis and osteogenic differentiation, thus promoting bone regeneration. - By directly affecting stem cell mobilisation, fucoidan facilitates more effective repair of damaged tissue, both in cardiovascular health, following a heart attack, and the health of joints and vital organs. • Astragaloside IV is already known for its telomere-lengthening effects. Research shows this saponin stimulates the immune system in various ways, in particular, by increasing stem cells in the spinal cord and lymphatic tissue and encouraging them to develop into active immune cells. - Astragaloside IV also supports proliferation of mesenchymal stem cells, pluripotent tissue stem cells that help form skeletal connective tissue such as bone and cartilage. • Extract of blueberry (Vaccinium uliginosum) can restore certain cell functions that decline over time. It has been shown to increase neurogenesis in the brains of elderly laboratory rats. Researchers experimented with neural tissue transplantation following cell damage caused by neurodegenerative disease or brain injury. As a general rule, transplanted tissue has very little chance of surviving, particularly in older recipients. But when animals were supplemented with blueberry extracts, the growth of the transplantation was more vigorous and cell organisation was comparable to that observed in younger recipients. Blueberry extracts confer their beneficial effects by increasing proliferation of neural stem cells. • Beta 1,3/1,6 glucan is a polysaccharide extracted from oats. Most research has highlighted its powerful immune-modulatory effects. The latest studies suggest that beta 1,3/1,6 glucan promotes haematopoiesis and boosts proliferation of stem cells, thus facilitating repair of white blood cells in bone marrow. • L-carnosine improves replicative capacity of myoblast cultures. - Certains myoblasts, called satellite cells, remain on the periphery of muscle fibres, intervening in its repair when damaged. However, with increasing age comes sarcopaenia (loss of muscle mass) and the satellite cells are no longer able to repair the damage. According to a study on myoblasts, the stem cells responsible for skeletal muscle formation, supplementing with L-carnosine increases their replicative capacity and also reduces the activity of beta-galactosidase. ¤ Epidemiological studies show that a diet rich in colourful fruits and vegetables, and thus polyphenols, can lower the risk of neurodegenerative diseases such as cognitive deficiency, dementia, Parkinson’s or Alzheimer’s disease. Research has demonstrated that certain natural substances can affect adult stem cells, and as a result, increase neurogenesis and improve cognitive ability. Scientists therefore examined a synergistic combination of extracts of blueberry, green tea, L-carnosine and vitamin D3. When given to rats, this unique combination clearly reduced oxidative stress, and in particular, demonstrated its ability to encourage proliferation of neural stem cells as well as their migration to damaged brain cells (for example, following a stroke). While stem cells are the subject of extensive study in the field of anti-ageing medicine, other approaches have also revealed positive results in combatting the effects of ageing. For example, cell metabolism can be stimulated by supplementing with nicotinamide riboside. Scientists have also discovered that damaged DNA can be repaired with the help of certain molecules such as l’AC-11®. 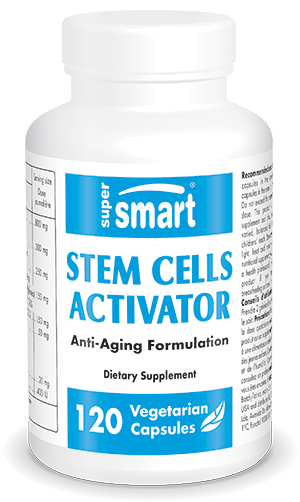 What improvements can be expected from using Stem Cells Activator? • an improvement in the condition and pain associated with degenerative complaints.